Swarthmore College 11-12 PM spring class sold out! 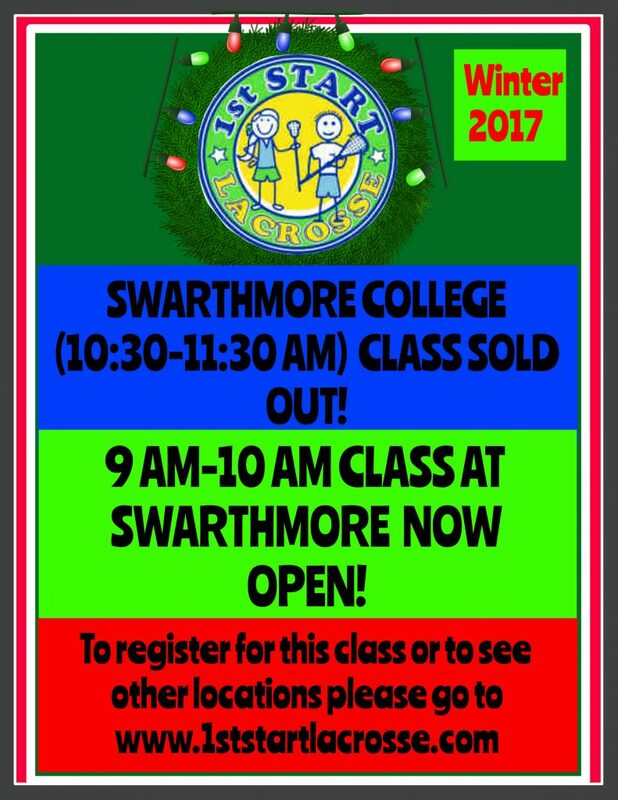 Our Swarthmore College 11-12 PM class has completely sold out! No worries though we’ve opened another class from 12:30-1:30 on Sundays that is now open for registration! Don’t miss out on the fun this spring! Register here!! Registration now open for spring!! 1st Start and Nature Boy Lacrosse Co. partner up to give little players the perfect STARTer stick!! 1st Start Lacrosse is excited to announce they’ve partnered with Nature Boy Lacrosse Company to offer our little players the perfect STARTer stick!! Nature Boy Lacrosse, (based out in Long Island NY) takes pride in making the craziest and best starter sticks on the market. Nature Boys’ Starter Sticks are so much more fun than your standard mini stick. The lacrosse head is slightly larger and wider so you can play catch and throw perfectly! The real ash wood shaft is super light and thin enough so that smaller hands won’t have any trouble at all gripping it. Nature Boy has designed the perfect 1st Start STARTer stick that players will be able to use at our sessions. The 1st Start logo is branded on the shaft and the pocket is strung perfectly so that our little players can get the look and feel of a real lacrosse stick! 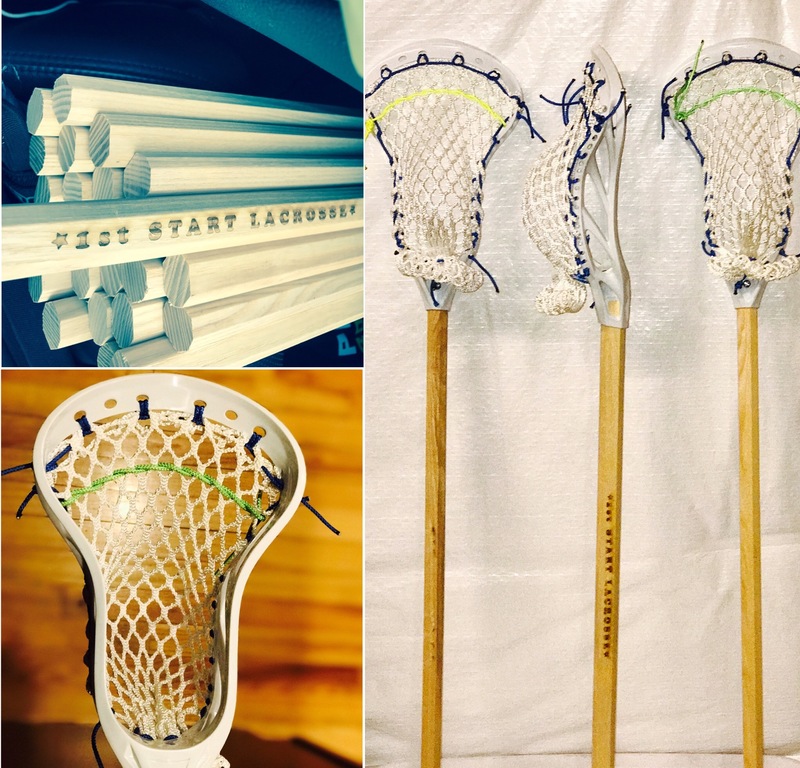 These sticks are absolutely perfect for beginners who want to have fun on the 1st Start Lacrosse field or in the backyard! Sticks will be available to use and test out at all of our winter locations! If any player enjoys and decides they want one, you can absolutely purchase a 1st Start STARTer stick for $30. To check out the various sticks and cool designs at Nature Boy Lacrosse Company, please check them out here!! 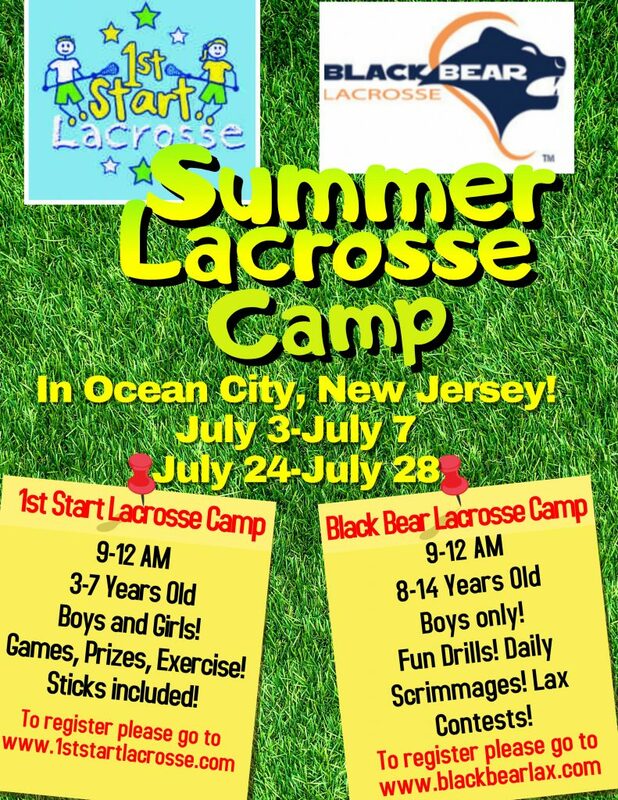 1st Start and Black Bear Lacrosse to team up in Ocean City NJ this summer for camp! This summer 1st Start and Black Bear Lacrosse are teaming up at The Tennessee Avenue Soccer Complex in Ocean City, New Jersey to give kids of all ages the ultimate lacrosse camp experience! 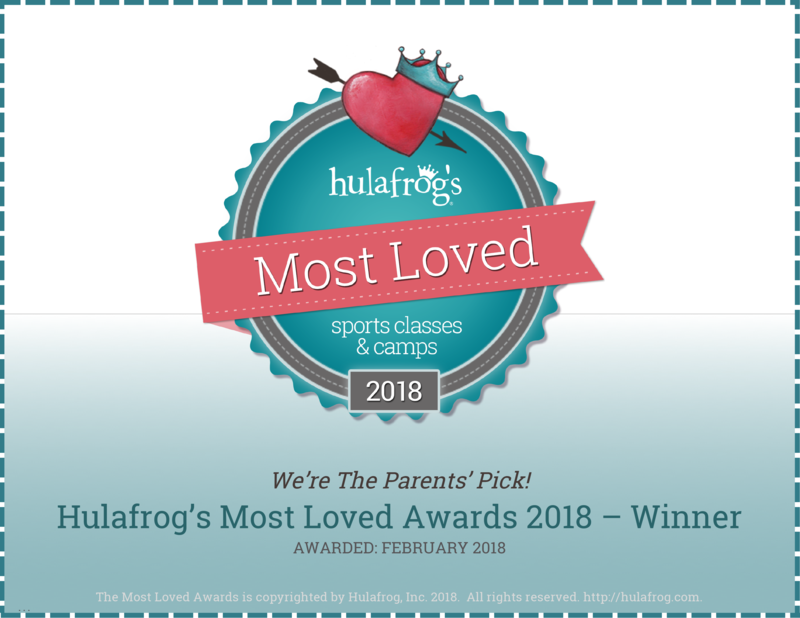 1st Start Lacrosse camp is the ultimate experience for young children (boys and girls ages 3-7) to learn the game of lacrosse in a fun and positive environment! 1st Start is run by very energized coaches who all have educational backgrounds. They developed a super fun curriculum to help children learn the basics of the sport. Each day at camp players will learn a new skill followed up by a ton of fun games and drills! There is never a dull moment on the field with Coach John and his staff! Sticks will be provided every day and players will receive a 1st Start STARTer pack among other prizes at camp! Black Bear Lacrosse camp is perfect for boys ages 8-14 who are looking for some fun and competitive practice. 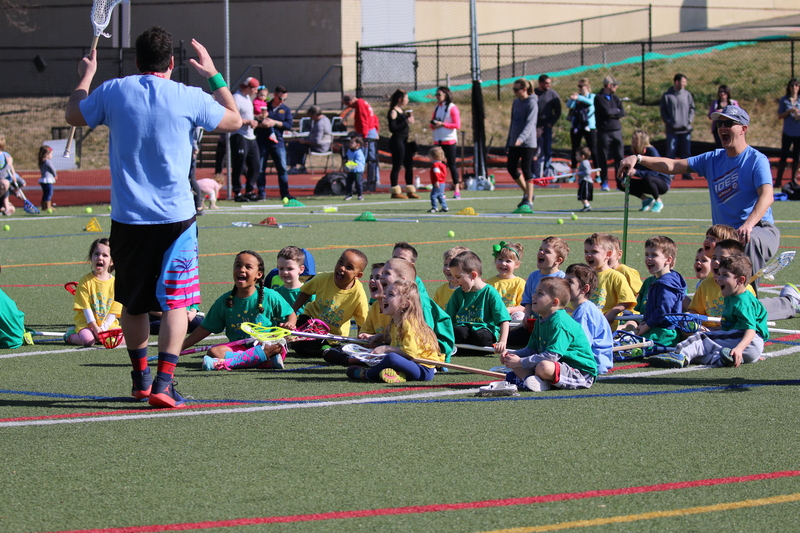 This camp is designed to introduce the game of lacrosse to beginning and intermediate level players, but also provides advanced training for experienced players. Black Bear campers will enjoy daily scrimmages, instructional sessions, contests, and daily personal interaction with the coaches. Players of all abilities and experience are welcome. Campers will be grouped according to age and ability. Black Bear teaches the fundamentals of lacrosse and develops the skills and understanding of the game needed to compete at the next level. The camps are run by top high school coaches in a fun filled, fast paced environment. Both 1st Start and Black Bear camps will run in the morning from 9 AM- 12 PM. There will be 2 different weeks of camp down in Ocean City. The first week is July 3-July 7 and the 2nd is July 24-July 28. 1st Start Lacrosse camp is open to boys AND girls and Black Bear Lacrosse camp will be for boys only down in Ocean City. To register for 1st Start Camp please click here! To register for Black Bear Camp please click here! Come join us at the 2nd Annual Delaware County Camp & Activity Fair January 28!! 1st Start Lacrosse is proud to be a sponsor at this years Delaware County Camp & Activity Fair! Last year over 40 organizations were on hand to answer questions regarding camp sign ups & open houses. 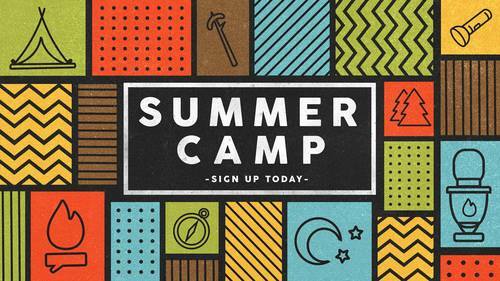 This a great opportunity for a one stop shop to keep the kids entertained all summer! This event is free & open to the public. The Fair will take place on Saturday, January 28th from 12-3 PM in the Nether Providence Elementary School Gym, located at 410 Moore Rd, Wallingford, PA.
To see what other organizations plan on attending, please ‘like’ the Delaware County Camp & Activity Fair page on Facebook and get more information!! 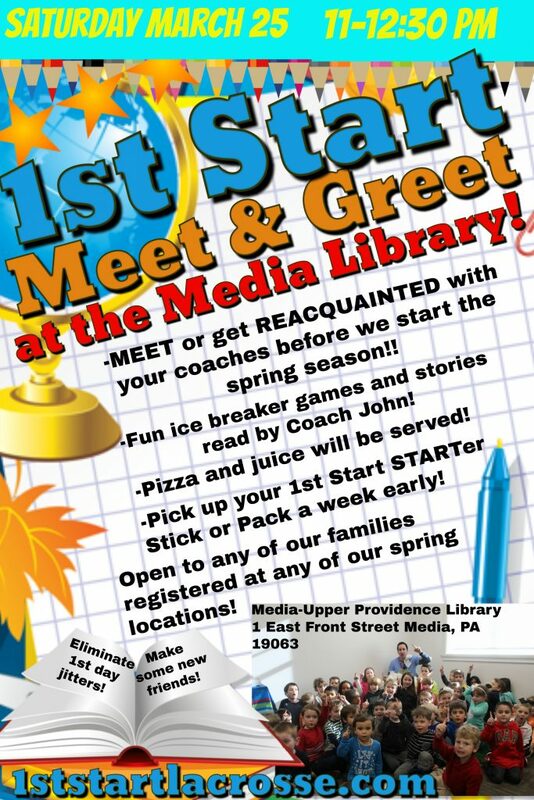 Join us for a 1st Start Meet and Greet at the Library! The 1st Start Coaching Staff is hosting a FREE meet and greet before our winter season starts! 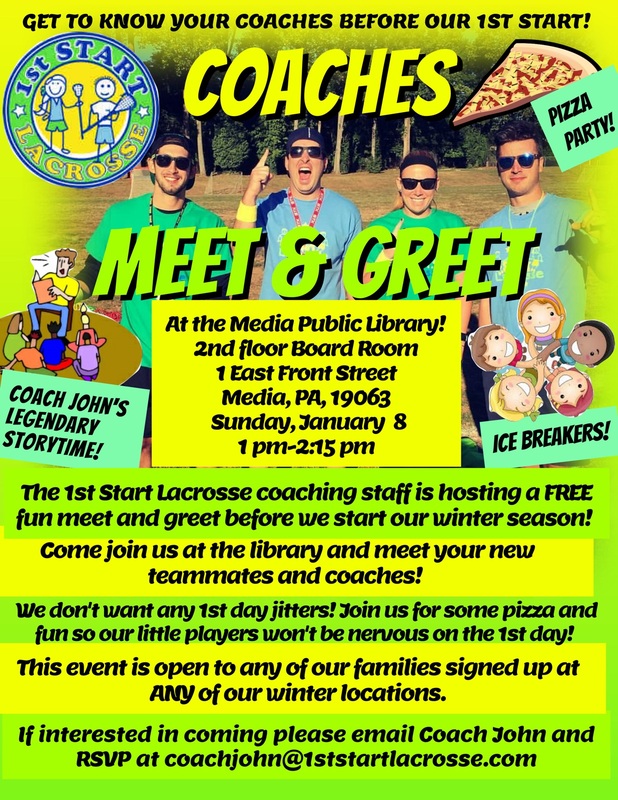 Come out on Sunday, January 8th to the Media Public Library and meet your new teammates and coaches. Our goal is to eliminate any nervous players or tears on the 1st day! The 1st Start coaches have a super fun afternoon consisting of pizza, ice breaker games, prizes, and a few fun stories read by Coach John! This event is open to any of our families registered at ANY of our locations this winter. It starts at 1 PM on the 2nd floor of the brand new Media Public Library and will run until 2:15 PM. Make your child’s 1st Start at Lacrosse one they will NEVER forget this winter! Our Swarthmore College 10:30-11:30 AM Class Sold Out! Our Swarthmore College 10:30 – 11:30 AM class sold out! We’ve opened another session at Swarthmore from 9:00 – 10:00 AM. Go to our Winter Curriculum page to register! Welcome to 1st Start Lacrosse! Registration open for Winter 2017! Welcome to 1st Start Lacrosse! A super fun starter program for kids all over the Philly area to learn the game. 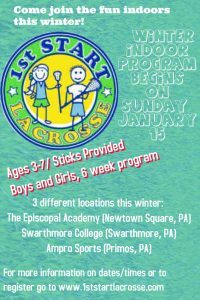 This is a great program for kids (ages 3-7) to get comfortable with a stick in their hands and learn the basics! This Winter we will be indoors at 3 different locations on Sundays. We will be using the field houses at the beautiful Episcopal Academy in Newtown Square and Swarthmore College in Swarthmore, PA. Our 3rd location will be on the turf field at Ampro Sports in Primos, PA.
To Register for our winter clinics click here!